An increasing body of evidence indicates that the bronchial epithelium plays a crucial role in the pathophysiology of chronic obstructive pulmonary disease (COPD). The aim of this study was to identify new genes whose bronchoepithelial expression is specifically altered in COPD patients. Primary bronchial epithelial cell (PBEC) cultures were established from exsmokers with stable airflow limitation and never smokers. Complementary deoxyribonucleic acid array technology was used to investigate the differential expression of 847 cytokine and cytokine-related genes between the two groups. Statistical analysis was performed by means of significance analysis of microarrays and Bonferroni-corrected analysis of variance on ranks. Discriminant analysis and light cycler measurements as well as flow cytometry and Western blotting were used to confirm the significance of the array results at both the messenger ribonucleic acid (mRNA) and protein expression levels. With respect to array experiments, melanoma cell adhesion molecule (MCAM) was identified as the sole gene showing highly significant upregulation in PBECs from COPD patients compared to never smokers. Light cycler measurements confirmed these results, revealing a 2.9‐fold and 2.0‐fold increase in MCAM mRNA expression in COPD patients compared to nonsmokers and smokers, respectively. In addition, these differences are associated with higher median protein expression levels. These results strongly suggest involvement of melanoma cell adhesion molecule in the pathophysiology of the chronic airway inflammation seen in patients with chronic obstructive pulmonary disease. This study was supported by a grant from the K. Wilder Stiftung, Berlin, Germany. The traditional view of the bronchial epithelium as a relatively passive physical barrier to the external environment has been superseded by the concept that the epithelial cell plays a key role in regulating airway inflammation 1. Human bronchial epithelial cells can synthesise and release a wide variety of pro-inflammatory mediators that influence the initiation and maintenance of chronic inflammatory airway diseases such as chronic obstructive pulmonary disease (COPD) 2, 3. Recent studies lead to the assumption that functional differences exist between epithelial cells from smokers with and without COPD and never smokers 4, 5. Probably due to the great variability in individual response to cigarette smoke, only a small proportion of those who smoke develop COPD. Functional differences between epithelial cells may contribute to the development of inflammatory changes affecting the airways in COPD patients. Since existing studies have mainly focused only on a selected number of cytokines, this area of research would greatly benefit from investigations utilising more sophisticated and comprehensive approaches such as array technology. The development of gene array technology allows study of the relative messenger ribonucleic acid (mRNA) levels of hundreds of genes simultaneously. This method can be used to screen for differentially expressed genes, especially in pathological conditions such as COPD 6. The present article reports observations on differentially expressed cytokine and cytokine-related genes in confluent primary bronchoepithelial cell (PBEC) cultures derived from exsmokers with stable airflow limitation and never smokers. Patients referred to the clinic of the Dept of Internal Medicine, University of Regensburg, Germany to undergo flexible bronchoscopy for various reasons were screened for inclusion in the present study. Selection of COPD patients was based on the definition and classification provided by the Global Initiative for Chronic Obstructive Lung Disease (GOLD) 7. In brief, inclusion criteria included patients with stable airflow limitation, a forced expiratory volume in one second (FEV1) of <70% of the predicted value, bronchodilator reversibility of <10% pred in FEV1 after 200 µg inhaled salbutamol and a smoking history of >10 pack-yrs. None of the patients with COPD had a history of atopy or evidence of atopy based on skin-prick testing for common aeroallergens. Smokers had normal lung function testing and a smoking history of >10 pack-yrs. Control subjects were lifelong nonsmokers with normal lung function and no history of airway disease. Subjects who had had a respiratory tract infection or exacerbation of the airway disease within the previous 8 weeks and those receiving systemic or topical corticosteroids during the previous 12 weeks were excluded from the study. All patients gave written informed consent, and the study was approved by the local ethics committee. Patients underwent fibreoptic bronchoscopy after light sedation and prior inhalation of lidocaine for local anaesthesia. Bronchial epithelium was obtained by gentle brushing of segmental and subsegmental bronchi under direct visual guidance by means of a protected brush. Samples were taken from the contralateral side of the lung in patients with suspected or proven bronchial malignancy to avoid potential contamination of the sample. Brushes were immediately placed in ice-cold bronchial epithelial growth medium and transported directly to the laboratory for further processing. The preparation and culture of PBECs was performed according to standard protocols described previously 8. Confluent cultures were growth-arrested for 24 h by leaving out epidermal growth factor and pituitary extract from the medium and washed twice with freshly prepared incomplete bronchial epithelial cell growth medium. Ribonucleic acid (RNA) was isolated using the High PureRNA Isolation Kit provided by Roche Diagnostics (Mannheim, Germany). RNA quality and quantity were evaluated by ultraviolet spectrophotometry and agarose gel electrophoresis. A human cytokine complementary deoxyribonucleic (cDNA) array (R&D Systems, Minneapolis, MN, USA), containing a comprehensive collection of 847 cytokines, chemokines and immunomodulatory factors, as well as receptors for these categories of molecule, was used. One array was used per patient. A maximum of four arrays were hybridised in parallel and exposed for 7 days on storage phosphor screens for analysis in the Cyclone Phosphoimager (Canberra-Packard, Dreieich, Germany). AIDA Array Metrix software (Raytest, Straubenhardt, Germany) was used for quantitative data aquisition from the array experiments. Arrays were normalised against nine positive control housekeeping genes (α‐tubulin, β2‐microglobulin, β‐actin, cyclophilin A, glyceraldehyde‐3‐phosphate dehydrogenase, human leukocyte antigen A0201, hypoxanthine phosphoribosyltransferase 1, ribosomal protein L19 and transferrin receptor) represented on the array. Comparision between different experiments was achieved using a human reference RNA (Stratagene, Amsterdam, the Netherlands) for normalisation between the different experimental sets. In order to identify potentially significant differences in gene expression, significance analysis of microarrays (SAM) software (Stanford University, CA, USA) was used 6. In brief, in SAM, a score is assigned to each gene on the basis of change in gene expression relative to the sd of repeated measurements. For genes expressed above an adjustable threshold, SAM uses permutations of the repeated measurements to estimate the percentage of genes identified by chance or the false discovery rate. Real-time polymerase chain reaction (PCR) was performed according to standard protocols described previously 9. All experiments were performed using the Light Cycler DNA Master SYBR Green I kit (Roche, Mannheim, Germany). Cytoplasmic β‐actin was analysed in parallel to each PCR and the resulting actin measurements were used as standards for presentation of the concentrations of specific transcripts as indicated. Oligonucleotide primers were designed according to published sequences (table 1⇓). Confluent cultured cells were trypsinised, washed once with 2% bovine serum albumin in phosphate-buffered saline (PBS; pH 7.4, concentration 1×PBS without calcium and magnesium) and stained for 45 min with the monoclonal CD146 antibody P1H12 (sc‐18837, 1:50 dilution; Santa Cruz Biotechnologies,Heidelberg, Germany) at 4°C. Fluorescein isothiocyanate-conjugated F(ab')2 fragments of goat antimouse immunoglobulins (F 0479, 1:50 dilution; Dako, Glostrup, Denmark) were used as the second-step reagent and incubated at 4°C for 30 min. As a negative control, unrelated mouse immunoglobulin G1 was used (IM0571, 1:5 dilution; Immunotech, Marseille, France) and incubated at 4°C for45 min. Membrane fluorescence was analysed using a FACScan flow cytometer (Becton Dickinson, San Jose, CA, USA). Western blots were performed by solubilising 1×106 PBECs in 200 µL lysis buffer. Whole cell proteins (100 µg per lane) were separated by sodium dodecyl sulphate gel electrophoresis under reducing conditions and blotted onto nitrocellulose. Blots were then incubated with the primary antibody (NCL‐CD146, 1:50 dilution; Novo Castra, Newcastle upon Tyne, UK) for 60 min. This was followed by a 45‐min incubation with a horseradish peroxidase-conjugated sheep antimouse antibody (sc‐2031, 1:2500 dilution; Santa Cruz Biotechnologies, Heidelberg, Germany). A chemoluminescence detection system was used for visualisation of melanoma cell adhesion molecule (MCAM) on Kodak X‐ray film (Eastman Kodak Company, Rochester, New York, USA). Individual blots were exposed for 30–120 s to optimise the signal-to-noise ratio. Bands were quantified using densitometry and expressed as arbitrary densitometric units. Lung function, flow cytometric and Western blot data are presented as mean±sem or median (range) as appropriate. Group data were compared using either Kruskal-Wallis analysis of variance on ranks with post hoc analysis or the Mann-Whitney rank-sum test for comparison of two groups. Significance was established at p<0.05. Different methods were used for statistical analysis of the array data. First, SAM software was used to identify significant genes. Secondly, the AIDA-derived and normalised expression data for each gene were compared between the two groups using the Mann-Whitney rank-sum test. For those genes that showed an increase in mean expression between COPD patients and control subjects, Bonferroni adjustment was performed to determine the level of significance (p<0.0002). Thirdly, for assessment of differences between the two groups, the results from the first 20 positive and negative genes were used for stepwise discriminant analysis. Significance of differences was checked using the Chi-squared significance test for every canonical discriminant coefficient. Thirty-three patients (13 lifelong nonsmokers, six smokers with normal pulmonary function and 14 exsmokers with COPD) were included in the study. All patients were referred for bronchoscopy for clinical reasons. Fifteen patients underwent preoperative diagnostic procedures for suspected peripheralor central carcinoma of the bronchus. Five patients had histologically proven carcinoma of the distal oesophagus. Seven patients were referred with a single episode of suspected haemoptysis for exclusion of underlying malignancy. Six patients underwent extended diagnostic procedures due to unexplained shortness of breath during exercise. The patient characteristics of the three groups are shown in table 2⇓. The mean FEV1/forced vital capacity ratio was 55.7±4.5% in the COPD group (p<0.001) and within normal ranges in the control and smoker groups. Twelve patients had COPD of moderate severity (GOLD II), whereas the remaining two were classified as GOLD III. All COPD patients were exsmokers with a median smoking abstinence of 5.0 (0.5–13.0) yrs. Bronchodilator medication in the COPD group consisted of long-acting inhaled β2‐agonists and anticholinergics in 10 patients. In addition, two patients took slow-release theophylline and two were treated solely with anticholinergics. No individual showed bronchodilator reversibility of >10%. None of the patients had taken oral or inhaled steroids for ≥12 weeks prior to the study. Cells were kept in culture for a median time of 7.5 (4–11) days until they were confluent. Growth characteristics were not significantly different between the three groups (p=0.485), and the median numbers of culture days were 7.5 (4–11), 6.5 (5–8) and 7.3 (5–11) in nonsmokers, smokers and COPD patients, respectively. 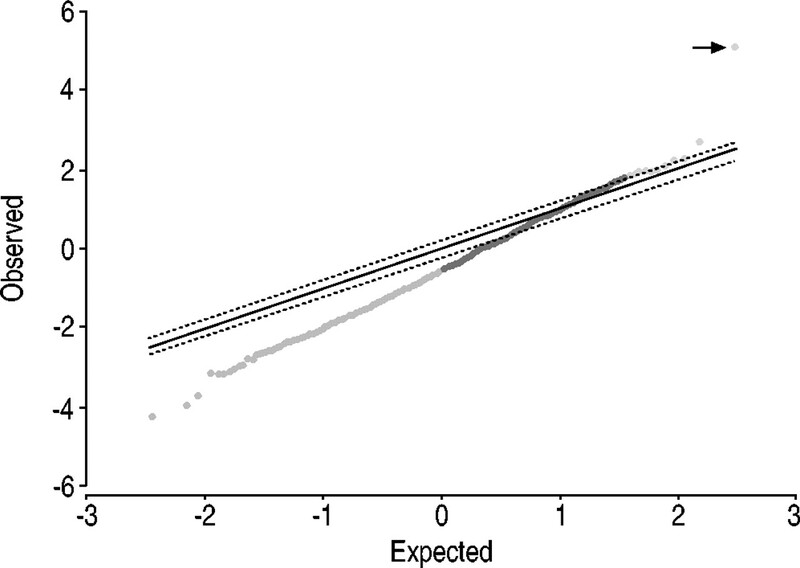 Figure 1⇓ shows a scatter plot of the observed relative differences against the expected relative differences. The vast majority of genes are located close to the line of identity, indicating no differences in gene expression between groups. With a threshold of 0.25, 13 genes were identified as being significantly upregulated. In addition, a false discovery rate of 28.4% was calculated. Table 3⇓ denotes genes with positive changes in expression determined to be significant by SAM. Significance analysis of microarrays. Scatter plot of the observed relative difference against the expected relative difference. The solid line indicates where these are identical. ═: 0.25 from the solid line. The arrow indicates melanoma cell adhesion molecule. Of the 847 genes present in the array, 287 showed greater expression in PBECs derived from COPD patients. For 23 genes, a p‐value of <0.05 was calculated. After Bonferroni adjustment, only MCAM expression reached the level of significance (p=0.0001), showing 5.2‐fold upregulation in COPD patients. Table 4⇓ lists the first 13 positive genes identified inthe Mann-Whitney rank-sum test. Four genes, MCAM, tumour necrosis factor receptor superfamily, member 11b/osteoprotegrin, G protein-coupled receptor 19 and polo-like kinase were identified with both analytical attempts. For the first 20 positive and negative genes identified using the Mann-Whitney test, Wilk's lambda was determined by discriminant analysis. The four genes with the lowest Wilk's lambda were used for further analysis. Thereby, MCAM andtransforming growth factor‐β receptor type I (TGF‐βRI) were identified as independent variables with respect to discriminating between the two groups. The standardised canonical discriminant coefficients for MCAM and TGF‐βRI were 1.176 and −0.959, respectively (p<0.001 for both coefficients). Classification results of actual versus predicted group membership revealed 100% accurate classification. In order to verify the induction of MCAM and inhibition of TGF‐βRI seen in the cDNA array at the transcriptional level, real-time PCR experiments were performed with total RNA from the same patients and an additional six COPD patients plus five control subjects, who were also used for protein expression studies. Furthermore, steady-state MCAM mRNA expression was measured in six current smokers without airway obstruction. Measurements of β‐actin mRNA levels did not vary significantly between the two groups (data not shown). COPD patients revealed a 2.9‐fold and 2.0‐fold increase in MCAM expression compared to control subjects (p<0.001) and smokers without airway obstruction (p=0.038), respectively. The median abundance of TGF‐βRI in control subjects and COPD patients used in the array analysis amounted to 11.9 (7.2–22) and 11.7 (7.6–14)%, respectively (p=0.96). 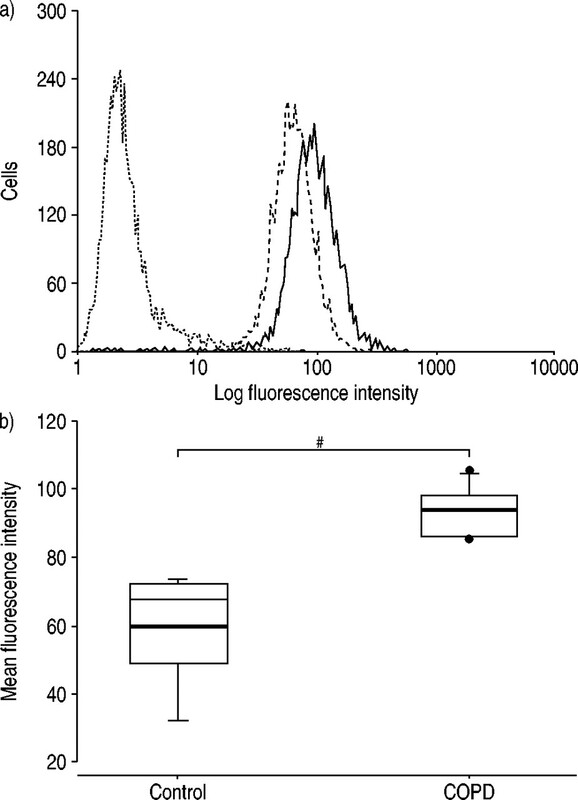 Figure 2⇓ summarises the results of the MCAM light cycler experiments. Light cycler analysis of melanoma cell adhesion molecule (MCAM) messenger ribonucleic acid (mRNA) expression in primary bronchial epithelial cells from control subjects (n=13), smokers without airway obstruction (n=6) and chronic obstructive pulmonary disease (COPD) patients (n=14). Data are presented as mean and interquartile range. The vertical bars represent the 5th and 95th percentiles. Within the boxes, the bold horizontal bars mark the mean value and the lighter horizontal bars mark the median value. •; outliers. ***: p<0.001; #: p=0.038. PBECs from five never smokers and six COPD patients were used for flow cytometry to evaluate membrane expression of MCAM. Of the PBECs derived from control subjects and COPD patients, 92.0±4.7 and 98.9±3.0%, respectively, showed MCAM expression. Furthermore, COPD patients revealed a significantly higher mean fluorescence intensity (p=0.002), indicating a 50% increase in MCAM membrane expression compared to control subjects. Figure 3a⇓ shows representative flow cytometry results from a control subject and COPD patient, and figure 3b⇓ summarises the FACScan data. Expression of exogenous melanoma cell adhesion molecule in primary bronchial epithelial cells from control subjects and chronic obstructive pulmonary disease (COPD) patients determined by immunofluorescence analysis using an anti‐CD146 mouse monoclonal IgG1. a) Representative results from a lifelong nonsmoker (‐ ‐ ‐ ‐) and a COPD patient (––––). ═: negative control stained with an isotype-matched negative control antibody. b) Mean fluorescence intensities of control subjects (n=5) and COPD patients (n=6). Data are presented as mean and interquartile range. The vertical bars represent the 5th and 95th percentiles. Within the boxes, the bold horizontal bars mark the mean value and the lighter horizontal bars mark the median value. •; outliers. #: p=0.002. Western blot analysis of MCAM expression was undertaken in three COPD patients and three nonsmokers. This analysis showed a major protein of ∼120 kDa and a minor protein of ∼110 kDa of variable intensity. Densitometric quantification of both bands revealed a median densitometric value of 986 (936–1,001) in control subjects and 2,020 (1,666–2,882) in COPD patients, a significant difference (p=0.028). 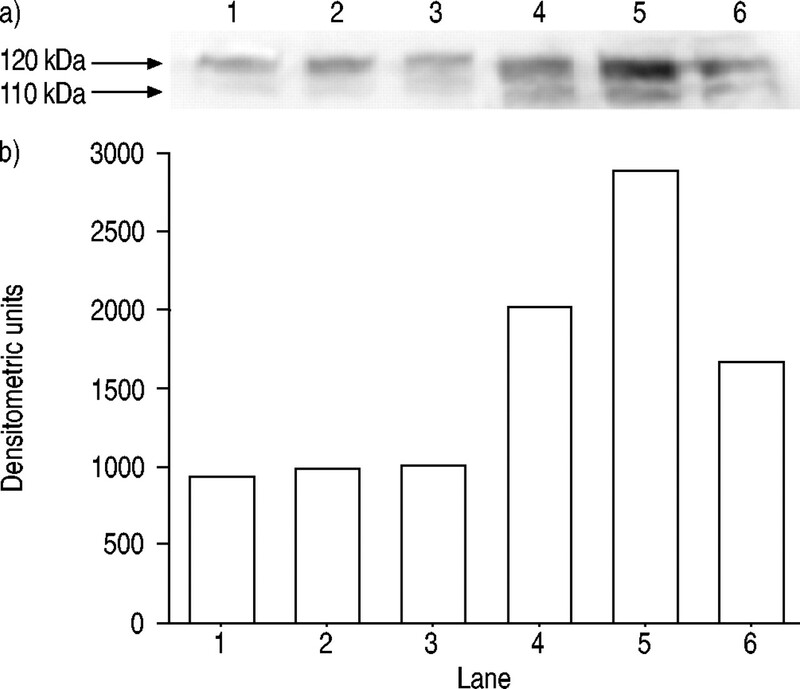 The Western blot results are summarised in figure 4⇓. a) Western blot showing melanoma cell adhesion molecule expression in primary bronchial epithelial cells from three lifelong nonsmokers (lanes 1–3) and three chronic obstructive pulmonary disease patients (lanes 4–6); and b) corresponding densitometric quantification. In the present study, it is reported that MCAM, a member of the immunoglobulin superfamily, is differentially expressed and induced in cultured PBECs derived from COPD patients. Array technology was used as a screening tool to measure the expression of several hundred cytokine and cytokine-related genes in parallel in order to identify new genes whose expression is different in bronchial epithelial cells from COPD patients compared to control subjects. Real-time PCR using PBECs from lifelong nonsmokers, smokers without airway obstruction and COPD patients confirmed these results. Protein expression as investigated by means of flow cytometry and Western blot analysis demonstrated, in a subset of COPD patients and control subjects, that the differences in mRNA expression also reflect differences in protein expression. Furthermore, it could be demonstrated that almost all bronchial epithelial cells constitutively express MCAM. Western blot analysis revealed two bands of ∼120 kDa and ∼110 kDa, which presumably represent post-transcriptional modification (e.g. glycosylation) which alters the molecular weight and interaction of the cell adhesion molecule, as has already been described for several cell adhesion molecules 10–12. Since MCAM mRNA expression was significantly higher in exsmokers with airway obstruction than in smokers with normal lung function, it seems unlikely that smoking itself is the main cause of the differential MCAM expression. Rather, the results indicate that differences in MCAM expression are related to COPD pathophysiology itself. It might be considered hard to believe that, of the 847 genes investigated, MCAM was the only one identified as being significantly upregulated between the two groups. Recently published studies have suggested increased epithelial expression levels of transforming growth factor‐β1 13, monocyte chemoattractant protein‐1 and interleukin‐8 in COPD patients 5. Although these genes were spotted on the array, none wasconfirmed using the present comprehensive approach. However, in the present study, cultured primary epithelial cells were used, which do not necessarily yield an identical gene expression profile to that obtained during bronchoscopy. This might be a potential limitation of the present study, but is not inconsistent with data from other groups. It was beyond the scope of the present study to investigate the functional role of MCAM expression on bronchial epithelial cells. Therefore, this aspect remains speculative and is hindered by the fact that the ligand for MCAM remains unidentified to date. MCAM or CD146 was originally cloned from a human melanoma cDNA library 14, 15. Further insight into functional aspects showed that this molecule acts as a cell adhesion molecule when expressed in melanoma cells 16. Recent studies have demonstrated that MCAM belongs to the growing immunoglobulin superfamily, which comprises a variety of cell surface receptors characterised by structural similarities in their extracellular domains 11. These molecules play an important role in a variety of biological and pathological processes, including regulation of organogenesis, maintenance of tissue architecture, inflammatory responses, wound healing and tumour invasion 17. Homophilic cell/cell interactions have been reported for neural cell adhesion molecule and platelet endothelial cell adhesion molecule‐1. Alternatively, heterophilic cell/cell interactions are also possible, and have been described for intercellular adhesion molecule-1 (ICAM‐1) and vascular cell adhesion molecule‐1, as well as MCAM 17. Neoexpression of cell adhesion molecules under inflammatory conditions is a well-known phenomenon. For example, ICAM‐1 is upregulated on basal keratinocytes in psoriasis and other inflammatory dermatoses 18. In addition, in primary explant cultures of human bronchial epithelial cells derived from COPD patients, greater susceptibility to the effects of cigarette smoke was seen with respect to the release of soluble ICAM‐1 in comparison to smokers without obstruction 4. In this particular investigation, soluble ICAM‐1 was used as a marker implicated in the development of inflammatory changes affecting the airways. Furthermore, ICAM‐1 serves as a homing receptor for activated T‐cells 4, 19. Therefore, upregulation of ICAM‐1 on basal epithelial cells in patients with COPD suggests a mechanism for recruitment of these cells and their migration into the airway lumen 20. Analogous to ICAM‐1, it could be speculated that MCAM may also mediate the homing of leukocytes in the airways of COPD patients. This possibility is supported by the fact that activation of T‐cellscauses neoexpression of MCAM on peripheral blood T‐cells within 1 day of stimulation, which could facilitate extravasation via putatively homotypic interaction of CD146‐expressing T‐cells and bronchial epithelial cells 21. Recent studies show that MCAM is localised at intercellular boundaries 22, 23. In addition, interactions with the actin-containing cytoskeleton have been reported, suggesting the involvement of MCAM in the organisation of cohesive contacts between adjacent cells 24. Given the important role of MCAM in different cell systems and its engagement in homophilic and heterophilic cell/cell interactions, it seems possible that MCAM contributes to airway remodelling in subjects with chronic obstructive airflow limitation. Several patients recruited for the present study underwent bronchoscopy due to suspected bronchial neoplasia. Since MCAM expression has been demonstrated in various neoplastic tissues 17, great care was taken to perform the bronchial brushing at the contralateral side. Thereby, the risk of contamination of the cell cultures was reduced to a minimum and confounding effects of neoplasia on the results of the study are unlikely. In summary, it has been shown that melanoma cell adhesion molecule is constitutively expressed in cultured primary bronchial epithelial cells derived from chronic obstructive pulmonary disease patients, smokers and control subjects, and that the steady-state messenger ribonucleic acid level of this adhesion molecule is significantly upregulated in chronic obstructive pulmonary disease patients in accordance with significantly higher protein expression levels. It is concluded that melanoma cell adhesion molecule expression by bronchial epithelial cells may play a role in the pathophysiology of chronic inflammatory airway conditions seen in chronic obstructive pulmonary disease patients. Devalia JL, Davies RJ. Airway epithelial cells and mediators of inflammation. Respir Med 1993;87:405–408. Martin LD, Rochelle LG, Fischer BM, Krunkosky TM, Adler KB. Airway epithelium as an effector of inflammation: molecular regulation of secondary mediators. Eur Respir J 1997;10:2139–2146. Barnes PJ. Mechanisms in COPD: differences from asthma. Chest 2000;117: Suppl. 2, 10–14. Rusznak C, Mills PR, Devalia JL, Sapsford RJ, Davies RJ, Lozewicz S. Effect of cigarette smoke on the permeability and IL‐1β and sICAM‐1 release from cultured human bronchial epithelial cells of never-smokers, smokers, and patients with chronic obstructive pulmonary disease. AmJ Respir Cell Mol Biol 2000;23:530–536. De Boer WI, Sont JK, van Schadewijk A, Stolk J, van Krieken JH, Hiemstra PS. 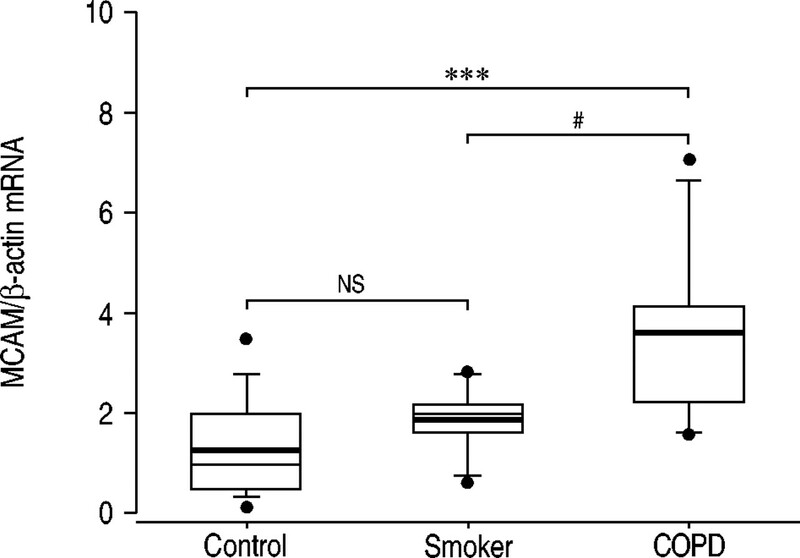 Monocyte chemoattractant protein 1, interleukin 8, and chronic airways inflammation in COPD. J Pathol 2000;190:619–626. Tusher VG, Tibshirani R, Chu G. Significance analysis ofmicroarrays applied to the ionizing radiation response. Proc Natl Acad Sci U S A 2001;98:5116–5121. Schulz C, Farkas L, Wolf K, Kratzel K, Eissner G, Pfeifer M. Differences in LPS-induced activation of bronchial epithelial cells (BEAS‐2B) and type II‐like pneumocytes (A‐549). Scand J Immunol 2002;56:294–302. Wolf K, Schulz C, Riegger GA, Pfeifer M. Tumour necrosis factor‐α induced CD70 and interleukin‐7R mRNA expression in BEAS‐2B cells. Eur Respir J 2002;20:369–375. Bardin N, Frances V, Lesaule G, Horschowski N, George F, Sampol J. Identification of the S-Endo 1 endothelial-associated antigen. Biochem Biophys Res Commun 1996;218:210–216. Koukoulis GK, Patriarca C, Gould VE. Adhesion molecules and tumor metastasis. Hum Pathol 1998;29:889–892. Owens GC, Edelman GM, Cunningham BA. Organization of the neural cell adhesion molecule (N‐CAM) gene: alternative exon usage as the basis for different membrane-associated domains. Proc Natl Acad Sci U S A 1987;84:294–298. Takizawa H, Tanaka M, Takami K, et al. Increased expression of transforming growth factor‐β1 in small airway epithelium from tobacco smokers and patients with chronic obstructive pulmonary disease (COPD). Am J Respir Crit Care Med 2001;163:1476–1483. Lehmann JM, Riethmuller G, Johnson JP. MUC18, a marker of tumor progression in human melanoma, shows sequence similarity to the neural cell adhesion molecules of the immunoglobulin superfamily. Proc Natl Acad Sci U S A 1989;86:9891–9895. Sers C, Kirsch K, Rothbacher U, Riethmuller G, Johnson JP. Genomic organization of the melanoma-associated glycoprotein MUC18: implications for the evolution of the immunoglobulin domains. Proc Natl Acad Sci U S A 1993;90:8514–8518. Shih IM, Elder DE, Speicher D, Johnson JP, Herlyn M. Isolation and functional characterization of the A32 melanoma-associated antigen. Cancer Res 1994;54:2514–2520. Shih IM. The role of CD146 (Mel-CAM) in biology and pathology. J Pathol 1999;189:4–11. Singer KH, Tuck DT, Sampson HA, Hall RP. Epidermal keratinocytes express the adhesion molecule intercellular adhesion molecule‐1 in inflammatory dermatoses. J Invest Dermatol 1989;92:746–750. Singer KH. Interactions between epithelial cells and Tlymphocytes: role of adhesion molecules. J Leukoc Biol 1990;48:367–374. Di Stefano A, Maestrelli P, Roggeri A, et al. Upregulation of adhesion molecules in the bronchial mucosa of subjects with chronic obstructive bronchitis. Am J Respir Crit Care Med 1994;149:803–810. Pickl WF, Majdic O, Fischer GF, et al. MUC18/MCAM (CD146), an activation antigen of human T lymphocytes. J Immunol 1997;158:2107–2115. Weninger W, Rendl M, Mildner M, et al. Keratinocytes express the CD146 (Muc18/S-endo) antigen in tissue culture and during inflammatory skin diseases. J Invest Dermatol 2000;115:219–224. Bardin N, Anfosso F, Masse JM, et al. Identification of CD146 as a component of the endothelial junction involved in the control of cell-cell cohesion. Blood 2001;98:3677–3684. Anfosso F, Bardin N, Frances V, et al. Activation of humanendothelial cells via S-endo‐1 antigen (CD146) stimulates the tyrosine phosphorylation of focal adhesion kinase p125(FAK). J Biol Chem 1998;273:26852–26856.